ST. PETERSBURG, Fla. -- As millions of Americans kicked off the unofficial start of summer this Memorial Day weekend, Minor League Baseball™ (MiLB™) helped its fans get ready for warm-weather activities. MiLB today announced that for the second consecutive year, it has teamed up with the American Cancer Society for the "Cover Your Bases" Sun Safety Initiative. The initiative promotes awareness and prevention of skin cancer, the importance of screenings, and precautions to protect skin from excessive sun exposure. More than 115 Minor League Baseball teams across the country will distribute 100,000 sunscreen samples, provided by Blue Lizard Sunscreen, to their fans between Memorial Day and June 30. More than 13,000 samples were distributed this past holiday weekend to launch the campaign. In addition to the free sunscreen samples, participating Minor League Baseball clubs will provide fans information on skin cancer and measures they can take to proactively reduce the risk of cancerous developments due to overexposure to UV rays. "Baseball is one of the great outdoor activities of the summer," said Courtney Nehls, Assistant Director of Community Engagement for Minor League Baseball. 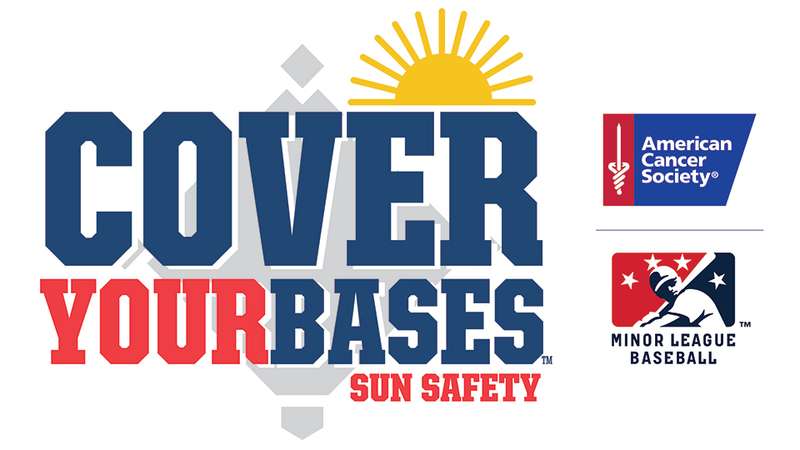 "In partnership with the American Cancer Society, we want to encourage Minor League Baseball fans to #CoverYourBases and take the measures necessary to avoid overexposure to the sun and the negative effects it may lead to." According to the American Cancer Society, skin cancer is by far the most common cancer in the U.S. An estimated 91,270 Americans are expected to be diagnosed with melanoma this year and more than 9,300 will die from it in 2018. Many of the millions of skin cancer cases diagnosed annually could be prevented by protecting skin from excessive sun exposure and avoiding indoor tanning. The American Cancer Society recommends seeking shade when you can, wearing protective clothing, generously applying sunscreen (SPF 30 or higher with broad spectrum protection), and not letting your skin tan or burn. The "Cover Your Bases" initiative is one of several charitable endeavors spearheaded by Minor League Baseball and Minor League Baseball Charities this season. Others include a collaboration with the Derrick Hall Pro-State Foundation to educate fans about prostate cancer awareness; the Stars & Stripes Cap Program, where teams will honor America by wearing specialty caps over the Fourth of July holiday weekend and help raise much-needed funds for military organizations; and the Joe Torre Safe At Home campaign, to generate awareness about domestic violence and help to end its destructive cycle. In August, Minor League Baseball and its teams will once again celebrate #MiLBCommUNITY Month, as part of an ongoing initiative to promote unity, understanding, acceptance and inclusion at its ballparks. For more information about MiLB Charities and the Minor League Baseball Charity Partners Program, visit www.MiLB.com.